I love Catalunya. I lived in Barcelona for 6 months some years ago now, and I go back regularly to see my coach at Freebloc climbing wall. Arriving back in the city no longer feels foreign – it feels like my second home. Having spent so much time out there I know the area pretty well, but there is so much rock that you never run out of new crags to visit or new places to explore. Someone told me once that there are over 5000 routes in Montserrat alone – an area just 40 minutes’ drive from Barcelona which most Brits don’t even ever venture to. I’m just back from a 3 week trip to Barcelona. I was working while I was there, and the main focus of the trip was one-on-one training with my coach which left only the weekends free to go cragging. 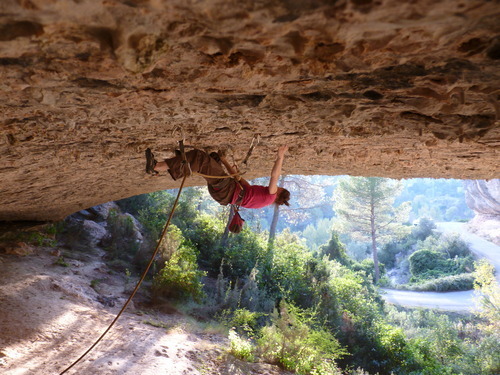 One was spent in Margalef getting beaten up by the pockets and super-steep roofs (candidate for the best 7c ever – a roof route that starts in the middle of nowhere, finishes in the middle of nowhere and is so steep it actually climbs downwards!). Another was spent seeking out crags which were new to us in the Tremp area. The first place we went to was Collegats, La Pedrera sector. This crag has a seriously cool approach in the form of a Tyrolean traverse along a thick steel cable over a river. The cable is angled downwards so that it’s really fun on the way in, and back-breaking on the way out when you are already tired. The crag itself is impressively long, and impressively intimidating when you first arrive. 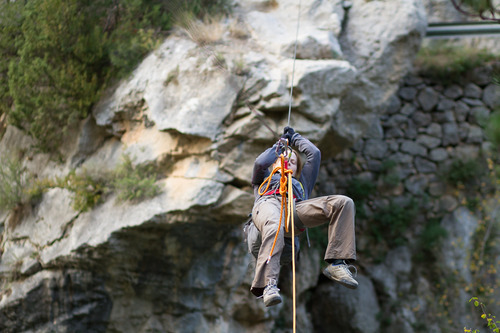 Many of the routes are almost 40m and vertical and look, from the ground, as if they have no holds at all. Once you get involved though, the grips appear and the routes are beautiful. Highlights were definitely Gaudir (7a) and Fleck (7b). We were hoping to return and try some of the harder routes at Collegats the next day, but bad weather drove us in search of warmer crags. Vilanova de Meia was the next port of call. This valley is beautiful and is full of vultures flying around in the air currents. The multi-pitch routes look amazing, but unfortunately, as Stu had a plane to catch later in the day, we only had time for single pitch cragging. We headed to El Cúpula sector, just off the road. Freezing fog made it pretty hard to get going at first, but once the sun broke through things got a lot better. This crag is super-steep, and the route I tried, Els Cupuladors (7b+/7c) was good although the rock quality wasn’t amazing which definitely did detract a little from the experience. It was great climbing in a new place though, and I’m really keen to go back for the multi-pitching. 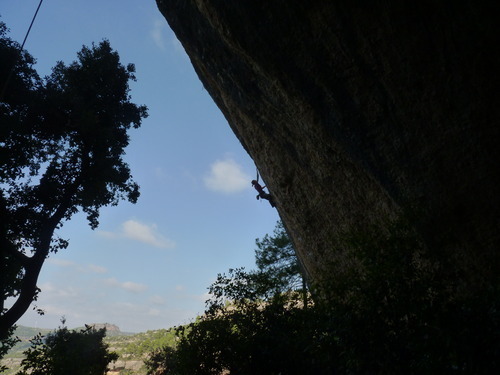 Catalunya certainly has it all from delicate slabs to beefy overhangs and everything in between. There’s also a wealth of single and multi-pitch routes to choose from at all grades, (usually) great weather and one of the best training venues I’ve ever been to in Barcelona. I feel very lucky still have connections there which enable me to keep going back. Why do I love translation? Because language is so cool! Every day I come across really funky ways of saying things, either in Spanish or my own language, that really make me smile. Trying to find ways of expressing such phrases in another language is where the fun and the challenge of translating comes in. Sometimes it’s such good fun, that I can’t quite believe people are paying me to do it (and sometimes it’s such a challenge that I wish they were paying me more!). Entrenamiento de pila – literally translated this means training batteries, so think energiser bunny. This refers to training stamina so that you can hold on forever on the really long routes. Los pies de gato – my personal favourite. Your cat’s feet are your climbing shoes because you wear them so tight that they bend your toes up like a cat’s paw. You frequently hear people referring to their gatos or cats when they mean their climbing shoes. ¡A muerte! – Not restricted to the climbing world, this expression literally meaning to death is a term of encouragement to a fellow climber to give it everything they have. The English equivalent, give it beans, is equally as bizarre and just as cool! Language is ace, and don’t let anyone ever tell you otherwise!